GeneHunter allows the use of several fitness functions that may be optimized during a single run of GeneHunter. In addition to the main fitness function, the user may enter a list of additional fitness functions. The goal of each fitness function (maximize/minimize/search for a specific value) is set independently. This feature will allow you to control more than one facet of an optimization problem. 1. 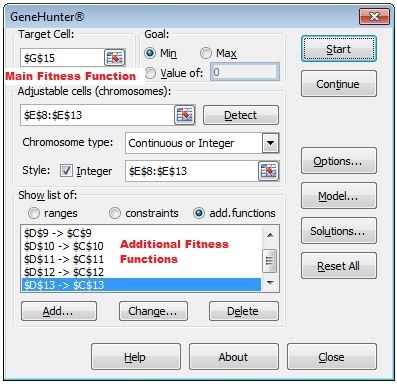 Type the cell reference in the fitness function edit box of the GeneHunter Dialog Screen or select the cell from the worksheet. 2. Click on the appropriate button to specify whether you want the fitness function to reach a maximum, minimum, or specific value that you type in the value edit box. 1. In the show list options, click on functions. 2. Click on the Add button to display the dialog box below. 3. Either type in the cell reference or select it on the worksheet. 4. Click on the arrow and select whether you want the fitness function to reach a maximum, minimum, or specific value. If you choose specific value, either type that value in the condition edit box or select a cell reference from the worksheet which contains the value. The main fitness function may be graphed on the worksheet. See Show and Store Graph for details. The main fitness function is always included in the Summary worksheet, while the values for additional fitness functions may be included if you choose to do so. See Find X Best Solutions for details.